For many decades, First Nations have desired a culturally appropriate curriculum; one that is informed and written by First Nations people. 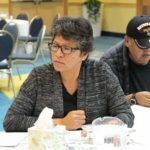 The Manitoba First Nations Education Resource Centre (MFNERC) is determined to reach an important milestone in the history of Manitoba by developing a First Nations’ curriculum framework Kindergarten to Grade 12 to be used to guide the education of First Nations’ students. This new curriculum will be grounded in our stories, our languages and our ways. The R&D Research Facilitators have implemented a three-part advisory process to ask the First Nations for direction in the development of culturally appropriate curriculum. The staff of MFNERC, the leadership and Elders of First Nations, and representatives of fluent language speakers from all five language groups have participated in various regional advisory sessions held from 2015 to 2017. The intent of the regional advisory sessions was to encourage participants to share their perspectives of what makes a good life or mino-pimatisiwin (Cree/Anishinaabe/Ojibwe-Cree); honso aynai (Denesuline Yatie); tokatakiya wichoni washte (Dakota). As well, participants were asked to share their experiences and understandings of teaching and learning, from their First Nations’ perspectives. 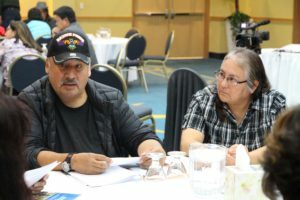 Data from each session was compiled and analyzed, resulting in the development of the initial drafts of the First Nations Curriculum Framework (FNCF). The Framework is still in development, as the team concludes the second year of their five-year strategic plan for the development of this curriculum. The strategic plan can be seen by clicking on the link below. Research Facilitators are currently speaking with individual community leadership to plan for community meetings to introduce the Framework to community members and schools. These community meetings will continue throughout the 2016-2017 school year. This March, as we enter into the third year of the strategic plan, curriculum development will continue with the participation of community members. Five Curriculum Development Working Groups will be established later this year, each responsible for the continued development of nation-specific curriculum documents. Development of these curriculum documents will continue over the next phase of the curriculum development process. The R&D team projects that Kindergarten to Grade 4 document development will be completed by late 2018, and the Kindergarten to Grade 4 curriculum documents should then be ready for piloting in the 2018-2019 fiscal year. Strategic planning for developing curriculum documents Grade 5 to Grade 8 will begin at that time. After being piloted and revised, the FNCF and supporting Kindergarten to Grade 4 curriculum documents are projected for school implementation in 2020. The vision for implementation is for MFNERC staff to work with individual First Nations communities, as communities use the FNCF documents to design locally-specific and culturally appropriate instructional programs and materials. Grounded in our stories, our languages and our ways, the FNCF will offer all First Nations communities another foundational resource for the positive development of our children’s identity. The work we have done together will help First Nations on our path of hope, where First Nations’ education is once again firmly in the hands of First Nations’ people. Should you have any questions about the First Nations Curriculum Framework or the curriculum development process, please contact Violet Okemaw, Director of Research & Development at violeto@mfnerc.com or call Kim Houle, R&D Administrative Assistant at 204-594-1290 ext. 2029.